Christmas is a time of peace, goodwill… and often a lot of unnecessary packaging. If you want to make a change, why not host an eco-friendly Christmas this year by following these plastic-free ideas for a happy, healthy holiday? There are several smart and stylish ways to avoid single-use plastic-coated wrapping paper this year. Choose paper without a plastic backing (it’s often thicker and looks more like kraft paper). Keep and reuse wrapping paper where possible. Tie with twine or ribbons that can be reused, rather than covering with sticky tape or using foil bows, which often come wrapped in single-use plastic packaging. Plastic plates and cutlery, while convenient for a Christmas party, are obviously out for a plastic-free Christmas, but even paper plates and napkins, which aren’t plastic items per se, do come wrapped in single-use plastic, so will need to be substituted. To eliminate plastic wrapping entirely, choose cotton or linen reusable napkins that can be laundered afterwards, and borrow or rent your any extra cutlery and glassware for Christmas entertaining. Many Christmas crackers have a throwaway plastic toy inside that gets discarded as soon as the meal is over. Make yours more sustainable by creating your own (you can source empty cracker sets online). 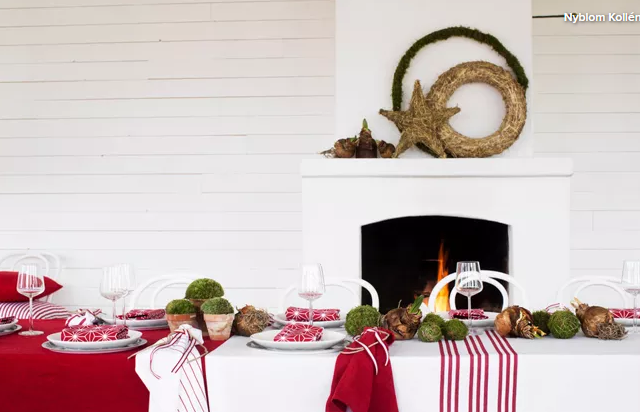 Alternatively, replace them entirely with a small tabletop gift, such as a little tree decoration or a tiny potted plant for guests to take home. When preparing food ahead of time or to take to another house, store in glass or enamel containers. To keep food fresh, use beeswax wraps rather than clingfilm. Instead of draping tinsel or plastic berries across a mantelpiece or picture frames, why not try to source the real thing this year? Most places that sell Christmas trees will usually sell ivy, mistletoe and holly, too. As long as you keep plants with berries well out of reach of children and pets, they will look fantastic. If you’re composting, chop leaves and stems up finely or they will take a long time to break down. Alternatively, have your local council take the sprigs away when the holiday’s over. If you already have plastic tree decorations, then keep and use them – the key here is not to buy any new ones. Making paper decorations and paper chains is a fun, affordable and inherently eco-friendly way to avoid buying plastic decorations. If you fancy giving it a go, there are plenty of online tutorials available and all you need are tissue paper, a glue stick, a pair of scissors and a little patience. If making them yourself doesn’t appeal, you can buy pre-made paper decorations, and nearly all will fold down flat after Christmas to be saved for reuse the following year. Making natural Christmas decorations can feel like a bit of a chore if you’re short of time in the run-up to the big day (and, let’s face it, most of us are). But one way to embrace fashioning your own Christmas wreath or garland is to turn it into an occasion. Invite friends and family over, get some mulled wine on the go, put some Christmas music on, and turn wreath-making into part of the festivities. Use scented materials such as pine needles and dried orange slices to ensure your wreath smells as good as it looks. Again, there are plenty of tutorials online if you need a little guidance or inspiration. To avoid giving gift sets encased in unnecessary single-use plastic packaging, try making your own. Purchase small items individually, then package them up in reusable wrapping, which can become part of the gift. Books, socks, bars of soap and small food items, for example, can all be made into personalised gift sets and packaged in a canvas bag, cotton or silk scarf, or wicker basket.